Bobble was a little reindeer for Father Christmas, but he had only just turned 3 months old so he still didn’t have any antlers. Bobble was the only one of Santa’s reindeer that couldn’t fly, for if you didn’t already know, the reason why Father Christmas’ reindeer can fly is because their antlers are magic. 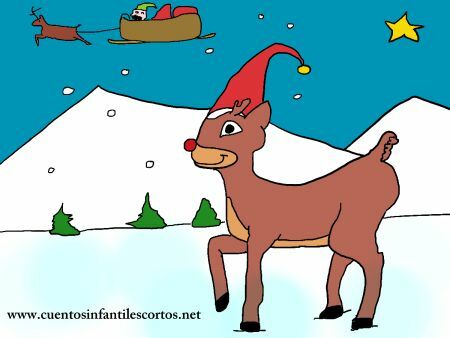 Little Bobble was always dreaming that his antlers had grown and that Santa Claus had picked him to pull the sleigh and take the toys to all the children’s houses. But then he would wake up and realise that it was all a dream and that his antlers still hadn’t appeared. picked him up very carefully so as not to wake him. Then he put him gently on the back seat of his sleigh, though he nearly woke up, for Santa Claus bumped into one of of the harnesses of his flying reindeer. That night was very special, for it was Christmas Eve when Santa Claus would put on his red suit and go from house to house delivering the presents that the elves had spent a whole year making. Everything was ready – the sack with the toys ready and waiting – so Father Christmas mounted his seat with little Bobble in the back. “Ho ho ho!” cried Father Christmas and the reindeer leapt into the sky. And it was just at that moment that Bobble woke up to see them soaring high in Santa Claus’ sleigh. And that was how Bobble learned that we must have more patience, for if we want dreams to come true we just need a bit of effort and perseverance.